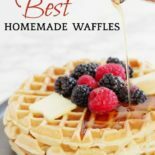 This is the BEST waffle recipe for homemade fluffy waffles, made simply using only eight ingredients! Even better? 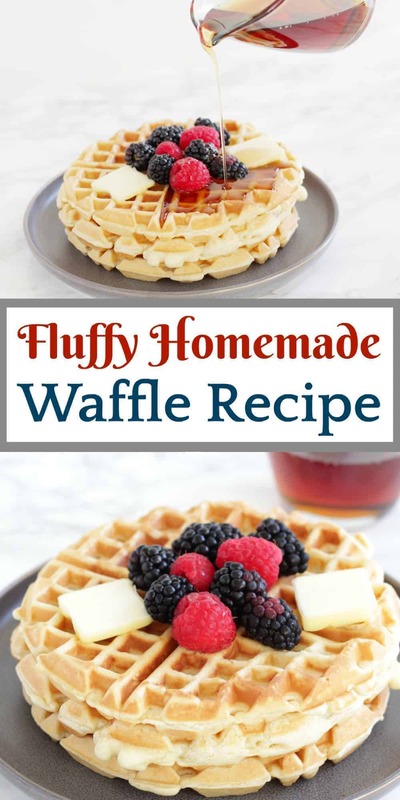 It’s a double batch fluffy waffle recipe so you can have plenty of yummy leftovers! Read on to find out the secret to making perfect waffles in your waffle iron, today. If you want to fluffy waffles made from scratch then this homemade waffle recipe is for you. These waffles are easy to make and taste great. Not only are these great breakfast waffles, but they also make great BFD — you know, Breakfast for Dinner! They are also a big hit with kids for school lunch served up with boiled eggs and blueberries. Plus, I am going to clue you into the biggest waffle making lie out there and how you can stop it from destroying your waffles. About nine years ago, my husband came home with a gift for me…a $30 Cuisinart waffle maker he saw at Target! He loved waffles, and wanted me to make some homemade waffles for him…so was the gift really for me or him, hmm? My first waffle making experience was a total FAILURE!!! With a capital F! In fact, all caps on that one. The batter stuck to the hot waffle iron like glue…it took me forever to scrape that stuff off! I have experimented with different batters and techniques over the years. At one point my oldest son had an egg allergy, so at that time I would make vegan waffles, with applesauce substituted for eggs and agave for sugar/honey. He got over the egg allergy, so I decided to start using eggs again..but kept the agave as the sweetener! This amount of milk should be perfect, but if you think your waffle batter seems a little dry, start by adding a splash of milk, stirring, and checking the consistency then. The batter should be like a slightly thick pancake batter; you don’t want it to run right off the waffle iron! You MUST oil the waffle iron. The directions that came with our waffle iron said not to oil our iron…lies, I tell you, LIES!!! I ALWAYS use spray oil on both the top and bottom sides of the waffle iron. Canola oil is preferred, as it has a higher burning point and milder flavor. You can make around 3-4 waffles on my iron before needing to spray again to prevent sticking. 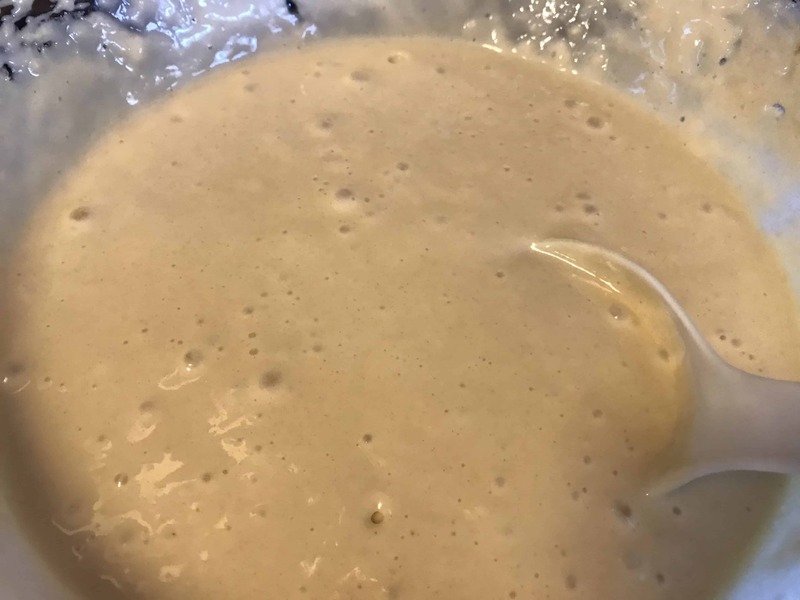 You should also allow your batter to rest 5-10 minutes after mixing before placing it on the hot iron…this allows the starch molecules to better absorb the liquids and makes your waffles more fluffy and puffy. You’ll know this is happening when you start seeing the bubbles in your batter. Another tip I have is to not overfill the iron. I use 1/4 cup + another 1/8 cup put directly in the center of the waffle iron, and that is the perfect size for my waffles! My iron has a timer so that you don’t have to guess when it’s done. The light is red when it is cooking and green when finished! I would suggest getting a waffle iron with a timer like this…it makes life (and waffle making) much easier. I keep my setting in the middle between 3-4, for softer, fluffier waffles. Then, use a fork to gently remove the waffle when it is done and voilà! You now have super fluffy homemade waffles! This recipe makes a DOUBLE BATCH. The benefit of making a double batch of waffles is that you will have leftovers to reheat quickly even on busy mornings! If you want to know the best way to freeze and reheat waffles you can go check out this handy guide! *Calorie count is approximate and may vary by serving size. 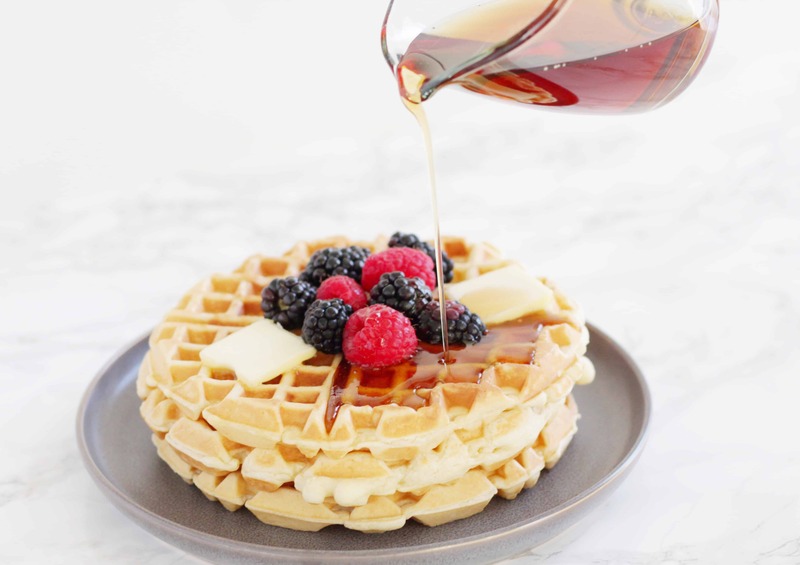 These fluffy homemade waffles are easy to make and use only 8 ingredients! Top with fruit, butter, syrup, or nutella for a dreamy breakfast. 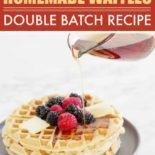 This is a DOUBLE BATCH, so you can freeze the leftovers for later, and have waffles at the tips of your fingers, anytime. Measure out the first three dry ingredients (flour through salt) into a large mixing bowl and stir to combine. In a separate bowl, measure out the milk. Crack the eggs into the milk and whisk until eggs are beaten. Add the agave, olive oil, and vanilla to the wet mixture and mix to combine. Add the wet mixture slowly to the dry mixture, using a handheld mixer or vigorous whisking to combine. Allow mixture to rest 5-10 minutes. Oil your waffle iron with a spray and then fill with the desired amount of waffle batter (I use 1/4 + 1/8 cups for each waffle). Close the lid and heat until cooked through or timer goes off. Remove gently with fork. Continue until all waffle batter has been cooked. I made waffles for dinner tonight and am wishing I found this sooner, as the recipe I used left much to desire :/ can’t wait to try these! Excellent! 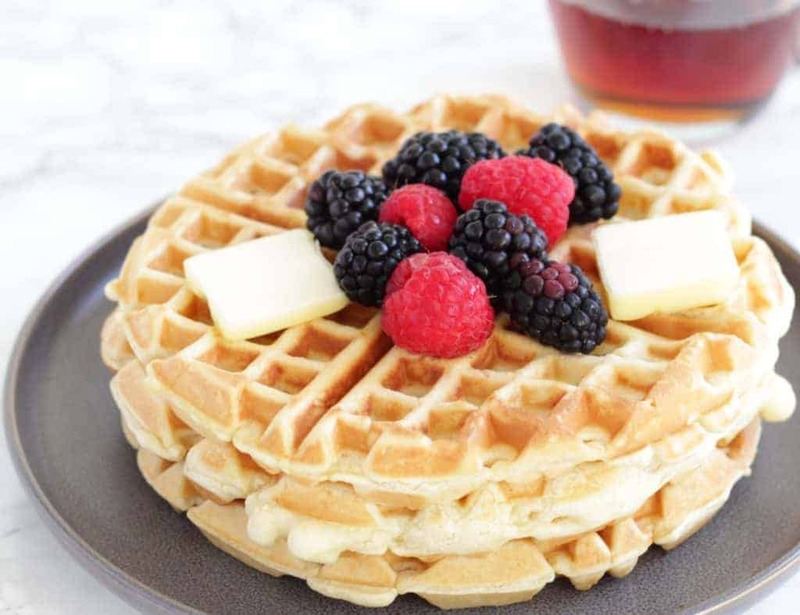 I hope that you like them 🙂 Waffles for dinner are the best! 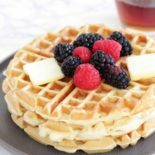 We love Waffle’s here at the cottage and often times have them on the weekend, we will have to try your recipe, it looks great! Thanks so much for sharing with us at Full Plate Thursday for the party this week. Hope you have a great week and come back to see us real soon! Thanks Miz Helen, have a great weekend! My kids love waffles so we’ll have to give this a try. Thanks for sharing on To Grandma’s House We Go! Yay, thanks Chas! Enjoy, my kids love these things! Yum! I’m saving your recipe! I love waffles, but usually use a mix! The waffle iron companies are conspiring against us. My waffles used to always stick too, because the directions said not to use oil. But after I ignored their instructions and used an oil spray, I didn’t have problems anymore! I think having eggs in the batter is key for very tasty waffles! Exactly, not using oil is a recipe for DISASTER! I don’t know why they say that. :/ Hope you guys love them! I love waffles! Need to get me a waffle maker though. But if I had one, I would have been making these right now. Yum! 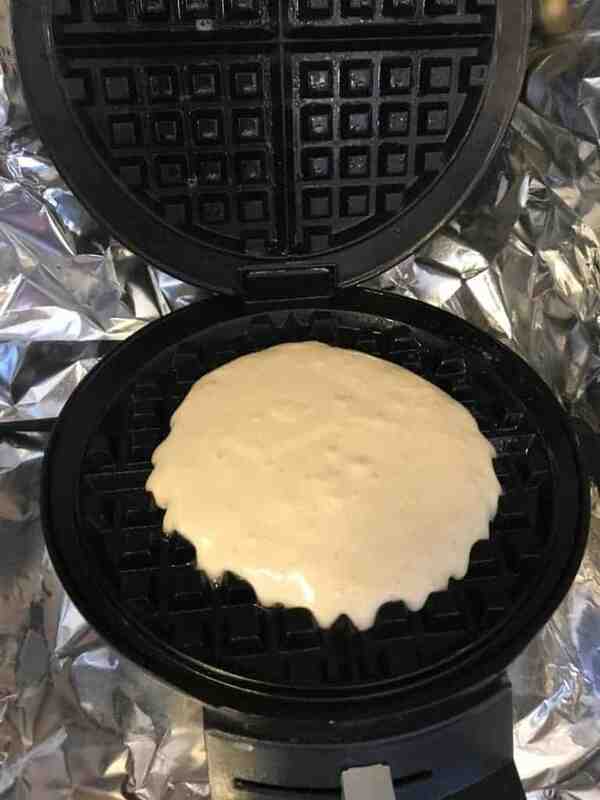 Waffle irons are great to have around! I see one in your future. 😉 Thanks for stopping by, Vanessa! I still want to make that bourbon milkshake! My nephew is coming to stay with me and he loves eating waffles. So, I want to learn how to make some good waffles for him. I liked your advice on adding honey and vanilla to the dough. It might be smart to see if I can buy some premade dough. Have fun with your nephew, Penelope!